Stuck In The Mud... Water? At the Masai Mara National Reserve, sometimes you will stop to view not animals but... people. 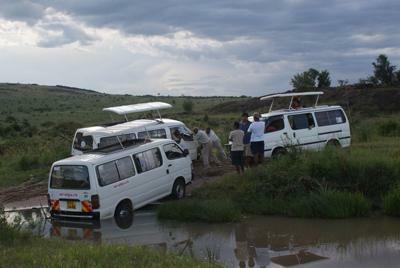 As a show of solidarity, drivers of various tour companies were trying to figure out how to get this tour van out of the muddy water. Comments for Stuck In The Mud... Water? This is a nice experience especially for fun loving tourists may it be local or non residents but at the same time its dangerous to step out of the vehicle cz you never know where the animals are in the bushes. Hey Evelyn, that's a nice pic... I know that especially in the rainy periods the tracks in the safari parks can get quite muddy... "Roads" aren't meant to be driven by Nissan vans then, but rather by 4x4 vehicles. But I guess too many safari tour operators still take their Nissan vans even if they needed to use off-road vehicles a long time ago... Thanks!